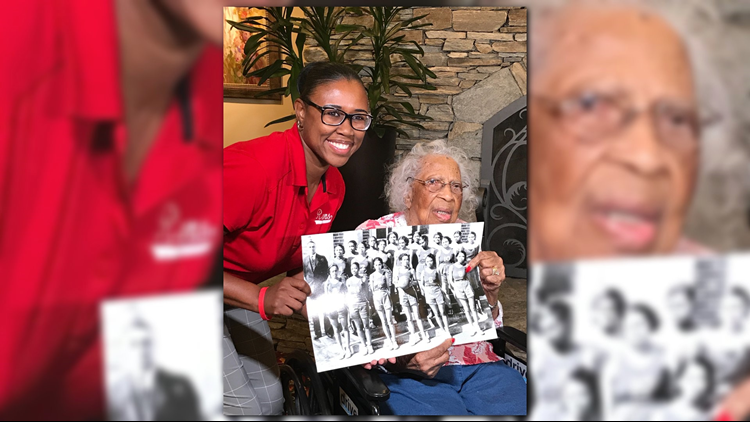 103-year-old Henrietta Cross Hatton Clark, was a student at WSSU back when it was the Winston-Salem Teachers College in the 1930s and played on the women's basketball team. DURHAM, N.C. (WFMY) – Earlier in August, Winston-Salem State University’s Chancellor Elwood Robinson made a special trip to Durham to visit one of the University’s oldest living alumni. 103-year-old Henrietta Cross Hatton Clark was a student at WSSU back when it was the Winston-Salem Teachers College in the 1930s. Clark is a retired teacher and also a former Women’s Basketball team player. University staff received an email on August 1, 2018 from a family member of a resident at Ms. Clark’s hospice center saying he had met her and told them about the encounter. “Mrs. Clark informed me that she founded the Henderson, NC alumni chapter, is proud to be a graduate of Teachers College and was a pretty good basketball player in her day,” the email explained. The email ended with a remark from Clark, telling the man to tell WSSU she still thinks of them. “Now, you make sure you tell some of the Winston-Salem people to come see me-- I'd like that very much." Back when Clark was a player, coaches were mostly men, the email noted. WSSU Women’s Basketball Coach L’Tona Lamonte paid Ms. Clark a visit on Wednesday, August 15. In the picture attached to the tweet, Ms. Clark is shown with coach Lamonte, pointing at herself in a black and white photograph on the 1935-1939 Rams Women’s Basketball team. On Friday, members of the Women’s Basketball Team surprised Ms. Clark in Durham and learned about her years on the team and beyond. According to the University, the Teachers College had an enrollment of about 550 students and a faculty of 22, a stark contrast to the upcoming 2018 Fall enrollment of over 5,000 undergraduate and graduate students and a faculty of 450. The College also only offered Bachelor of Science in Education, and today offers more than 70 undergraduate and graduate programs.